The Golden Globes were a little over a week ago, but the outfits are still iconic and relevant, so let’s take a look at what people wore this year! We’ll start with Rami Malek, he was in the hit biopic Bohemian Rhapsody which was released in October (and was amazing by the way – see it if you haven’t already). Rami won Best Actor in a Major Motion Drama, which was amazing because Bohemian Rhapsody wasn’t expected to win anything due to the competition from A Star is Born. Anyway, Rami was seen wearing a standard black tux (what more do you expect to see from a man on the carpet?) but with a massively oversized bow tie matching the white of his shirt. Honestly, that something so simple can be as effective as that is outstanding. Cody Fern is probably best known for his role in American Horror Story (which I need to catch up on) and he was also in the true crime series The Assassination of Gianni Versace: American Crime Story (by the way, if anyone knows where I could watch this, that would be great!). I really appreciate the femininity in this outfit. 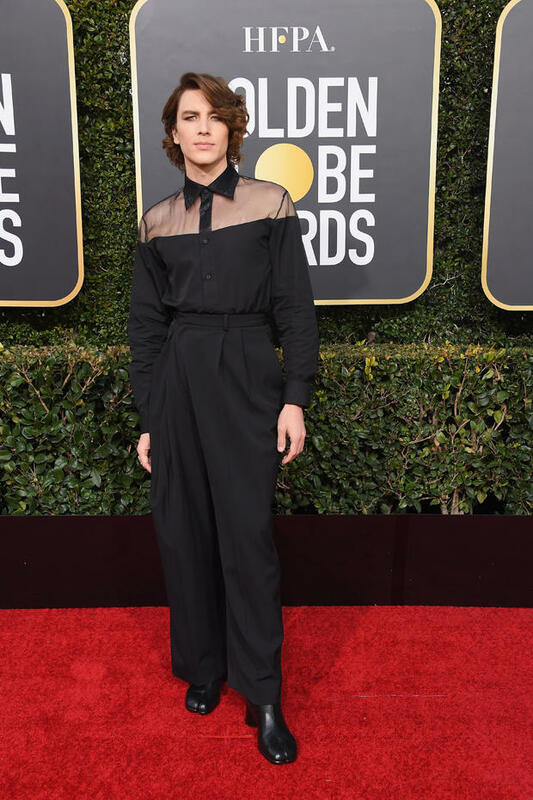 The sheer shoulders and oversized boxy trousers are something that you wouldn't normally see on a man, and I think that it's important that both men and women stretch the status quo when it comes to fashion. Fashion is something that should be fun, but it can also be a statement and something that means more to people than just a nice suit or dress. 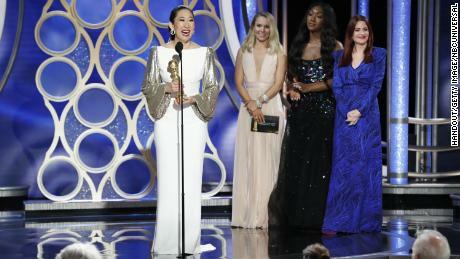 Sandra Oh won Best Actress in a Television Series (Drama) for the show Killing Eve. But not only did she win an award, she hosted the thing! Oh is an amazing actress and her award was well deserved. She had far too many looks to go through here so we’re going to focus on the outfit she wore when accepting her own award: a long white dress with golden bishop sleeves. Not my favourite of her outfits, but iconic nonetheless. I don’t think it’s possible to write about the 2019 Golden Globes without talking about the Fiji Water Girl. She upstaged pretty much everyone she was next to (whoops!) and Fiji has been called out by Jamie Lee Curtis for the ‘publicity stunt.’ She looks great though, and as people on the internet are saying, she dressed for the job she wanted, not the job she had. That’s it for this edition. See you all next time!